These are the dudhi na muthiya my mom made for breakfast when they were over a few weeks back. They are really simple, healthy and really really delicious. Every Gujarati has their own version so a lot of the ingredients are to taste and are optional. This is generally served for breakfast along with some piping hot ginger tea. 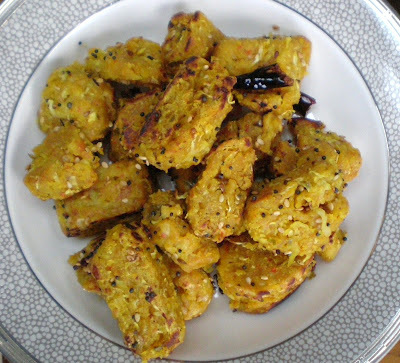 What you do is - grate a dudhi or even a zucchini or some other squash, add some salt and then squeeze out the liquid, then you add some whole wheat flour, crushed ginger, garlic, green chillies, a few tablespoons of semolina or rawa and besan, salt and a pinch of sugar, some turmeric and lemon juice. Bind all this together with the water that was squeezed out earlier from the dudhi. Then you form them into logs and steam for about 20-25 minutes and then cut them into small pieces and do tadka or tempering of : oil, mustard seeds, curry leaves, asafeotida, dried red chillies and sesame seeds. This can be served either hot or warm with some yogurt for dipping. It's been a crazy summer here. Hot as Hades to put it nicely. The heat is untolerable and unbearable to say the least. When it's 95 deg, everyone's all happy and confessing how lucky we are that it's "not that hot". What the...???? Are they serious? Well it couldn't be summer without a little bit of grillin' right? I made these tofu and veggie kebabs. I made tandoori paste from barbeque masala, garlic, ginger, amchur, garam masala and green chillies and mixed it all into yogurt and soaked some pre-pressed tofu and chopped veggies. Serve with biryaani and naan.